Paper registration at events is over! GuestCloud’s app enables a fast and simple guest check-in in less than 3 seconds per guest. Guests will never have to wait at the door again! Application runs uninterrupted even if the wifi connection drops. Once service is restored, data is automatically resynced across all devices. GuestCloud follows the latest data encryption standards and protocols to keep your data secure. Our IT structure is in compliance with the GDPR guidelines. You can find and check-in guests in seconds thanks to a quick name search or a QR/bar code scan. An event website is a useful source of information for your guests. It can contain a registration form, details about the venue, event dates, map, countdown timer, automated weather forecast, detailed schedule and any other useful information according to your needs. A dynamic registration form or response buttons for guests to confirm/decline their attendance are are usually a part of event website too. It is an easy way to collect the required information. Design of your event website can be adjusted according to your graphic template. If necessary, we can design the graphic for you, based on the event characteristics. We can prepare your microsite in multiple language versions. Microsite content and language is personalized. It is automatically loaded depending on the guest language and other attributes assigned in database. Send your guests email invitations with RVSP buttons. 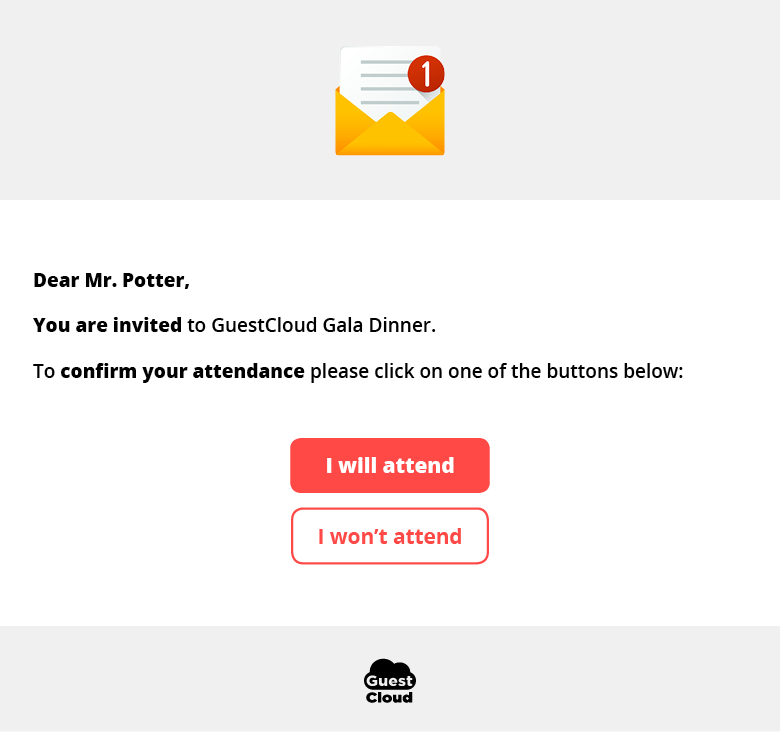 After receiving an invitation, guests can confirm or decline their attendance in one click. A confirmation email including all event details is then automatically sent to the attending participants. The entire email communication is fully personalized. Emails are addressed to each guest individually through a personalized salutation and content. Invitations can be easily customized according to your event design manual. Collection of guest attendances and absences is automated. Responses are tracked in real time, ensuring event can be managed at ease. By tracking the RSVP progress in a clear dashboard, telling you who has responded or opened the invitation, GuestCloud saves you the time spent on organising the whole invitation process. 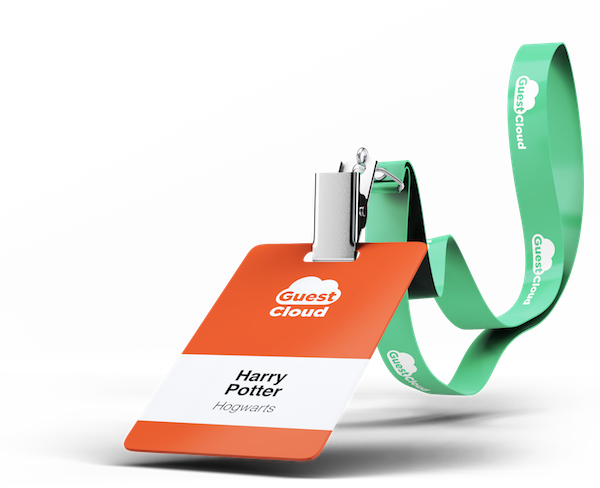 Badges are instantly printed upon the attendee check-in, eliminating a endless search for the right badge in a bulk of badges printed beforehand. No more badge printing and matching arrangements before the event. 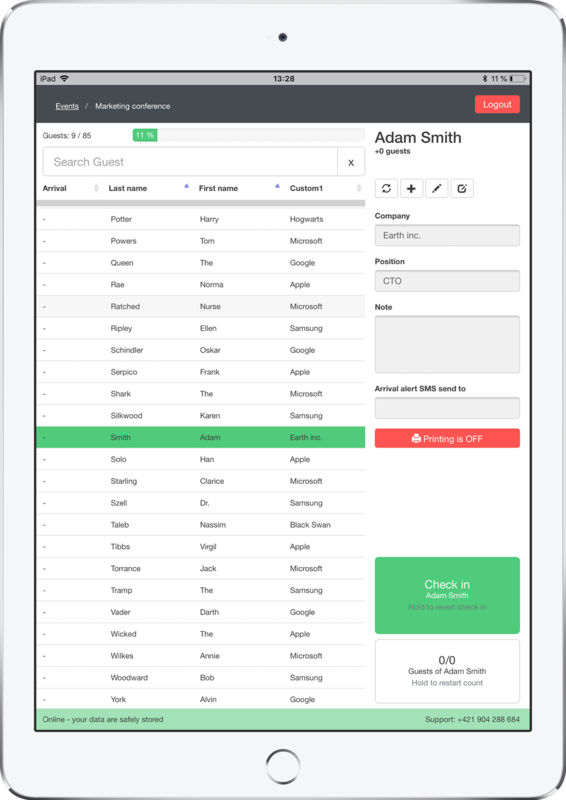 Add new guests and edit attendee list in tablets directly on-site. This way professional badges can be printed for every attendee, even a latecomer. With our app attendees can sign-in using tablets at arrival. A great solution if you need an indubitable proof of presence. E-signatures at events can be used to obtain various types of agreements such as an informed consent for recordings and image. Your event can now adhere to one of the important GDPR guidelines. All signatures are safely stored, allowing you to find any guest signature, from any of your events, whether it was yesterday or a year ago. Are you expecting a special guest, a speaker or a VIP? Set automated text alerts up to notify yourself of the important person's arrival. Welcome your guests with automated and personalized text messages. A personal text message can greet your guests right after they check-in. Also, with text notifications you can keep your guests up to date, so they do not miss anything. Digital raffle with an option of live results projected. Present attendee names are drawn and displayed on a screen. No raffle tickets are thus needed, what is often appreciated by the event moderators.